Some of the new features of the upcoming release for Windows Phone code-named Mango were revealed at MIX11 with more to be announced in the upcoming months. Exciting stuff! How would you like to be one of the first to get a next generation Windows Phone for free? And to do that you have to promote your WP7 app for free. 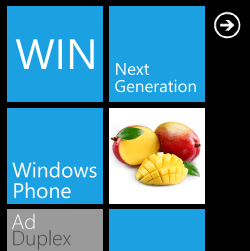 Yes, promote your app for free on AdDuplex and get a brand new, not yet announced Windows Phone. Publish a Windows Phone app that participates in AdDuplex ad exchange program by October 1, 2011 and you’ll be automatically entered into the drawing. Head over to our special page for details and official rules.